Matthew Apgar - mapgar@shawmedia.com Shari Schaumburg of Algonquin uses her snow blower to clear her driveway on Tuesday, Feb. 6, 2018 in Algonquin. "I love the snow," Schaumburg said, adding "as long as you bundle up, it's no biggie." 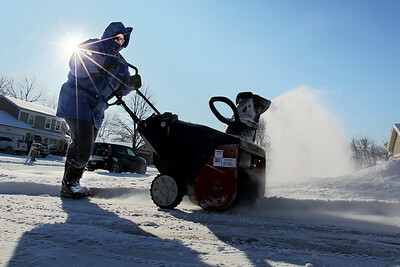 Shari Schaumburg of Algonquin uses her snow blower to clear her driveway on Tuesday, Feb. 6, 2018 in Algonquin. "I love the snow," Schaumburg said, adding "as long as you bundle up, it's no biggie."